Balotelli is an idiot, but are we to blame? Mario Balotelli is an easy man to dislike. A host of bad press has followed him since his move to Manchester City from Italy. Having received more red cards than he might (or at least Mancini and City fans might) have wanted, cheated on one barely famous celebrity with another and been reprimanded for throwing darts at youth players, all within his short stint at the club, he has quickly made the wrong sort of name for himself. He is by no means alone. Here at Good Feet For A Big Man we take great delight in documenting misdemenours by Premiership footballers. This season alone, England stalwarts Ashley Cole and Wayne Rooney have been under the spotlight for shooting someone on work experience and delivering a round of noxiously concocted expletives into a camera, respectively. Why do so many of these young men act in ways that cause so much consternation amongst the rest of society? A partial answer is that they suffer from their actions being scrutinised far more comprehensively than most other people. Many of the dubious activities reported in the press will be matched by those from people outside of the media glare, who will generally be saved from the scorn of the nation. A lot of these footballers start their professional careers at ages when many of us who are not blessed with footballing talents would have been heading off to begin university. These are years that combine a lack of responsibilities with a feeling of escapism and tend to be our most reckless. Everyone, generally, has tales from this period that they are not so proud of in retrospect. Society has a calming influence on the majority of the population after this stage, though, namely by impoverishing us to such a level that we must conform to norms in order to gain a way out of destitution. Footballers do not face such checks and balances. The wealth they manage to accumulate at such a young age, along with a good amount of free time, means they can continue to act in a carefree manner. Importantly, at the same time, players’ perceptions of themselves and of the identity of a footballer is built upon and glorified. The mantra that ‘no one is bigger than the club’ has been ubiquitous amongst football supporters. This sentiment has been degraded over time though and is no longer true in some quarters. Focus has shifted towards the more individual nature of football. The media have played an important role in this. The best stories are always given a strong human element and their ongoing narrative has been advanced with playing on the individual week to week stories of particular players (the continual battle between Messi and Ronaldo in La Liga scoring charts for instance). The added hype surrounding every game now and concentration of the ‘stars’ of each game means that fans spend more time anticipating what their favourite players might do on the next Super Sunday. The social acceptability of the idolisation of prominent people (in this case footballers) has also fulfilled an important function. With the decline of religion and traditional community structures, for many people it acts as a shield from isolation or loneliness, where they can love and feel that they are loved by a constantly available person. A quick browse around Cesc Fabregas’s Twitter account, for example, reveals messages from infatuated fans. Today’s favourites include “You’re the most special thing in this world”, “u r amazing captain, love u a lot cesc” and the rather weird “@cesc4official its raining here, babe. Miss you xoxo”. It is not hard to see that players receiving this perpetual attention, or who are at least aware that other players attract such doting, will have inflated senses of their own value and position in the world. 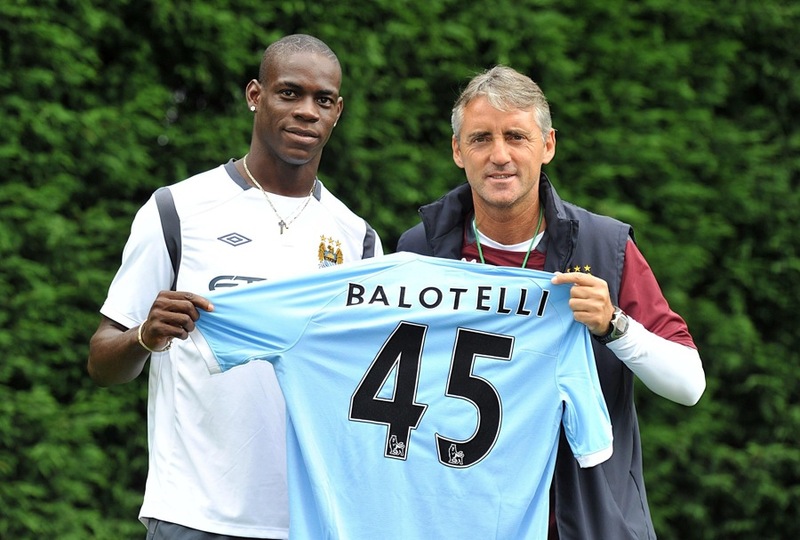 It is this point that is so poignant with Balotelli. It is not all the questionable off-field antics that is so irritating about him. It is the fact that he seems so ambivalent on the pitch about the fate of his team. After witnessing a performance from him against Liverpool where after coming on as a substitute, he had to be replaced himself due to a complete lack of effectiveness and effort, it is clear to me that he only puts the effort in when it suits him. His mindset seems to be that it doesn’t matter if he fails to put in the miles when he can’t be bothered as people will still love him, he will still be earning millions and he will still be able to do as he chooses. Whatever his faults, Balotelli has provided my Youtube video of the year, so far – see below. This entry was posted in Football and tagged Football, liverpool, Manchester City, mario balotelli, Messi, Ronaldo. Bookmark the permalink.